Shown (from left) are: Brian Sweeney, partner, Consult IMC; William Mascetta, program manager, Hope VI; mayor Amicone; Lynch; and Shuldiner. 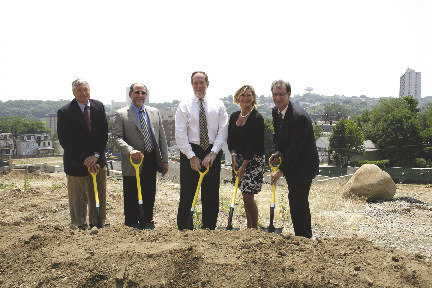 With major construction already underway, the city celebrated the ceremonial groundbreaking of two housing developments totaling $64.6 million at the former site of the historic Mulford Gardens Public Housing Complex and Ashburton Ave. Members of the project team include Monadnock Construction, Inc. as the construction company and H2M as the architect. Mayor Philip Amicone, joined by federal, state and local elected officials, as well as more than 100 community leaders and residents, presided over the ground breaking ceremony for Park Terrace at Croton Heights, a new, $19.1 million, 49-unit senior rental facility, and Grant Park at Croton Heights, a $45.5 million residential apartment community that will bring 100 affordable apartments to the city. Both complexes were developed by The Municipal Housing Authority for the city in conjunction with The Richman Group Development Corp. and Landex Development, LLC, and will be managed by Rental Housing Management Partnership. On hand for the event were Westchester County executive Robert Astorino; executive director of the Municipal Housing Authority for the city Joseph Shuldiner; executive deputy commissioner for the NYS Division of Housing and Community Renewal (DHCR) Michael Skrebutenas; regional administrator for the Department of Housing and Urban Development Adolfo Carrion; president & CEO of the Yonkers IDA Ellen Lynch; president of The Richman Group Development Corp. Kristin Miller; senior VP, The Community Preservation Corp. Sadie McKeown; director Citi Community Capital Barry Krinsky; and senior VP, Bank of America Merrill Lynch Todd Gomez. Amicone said, "These ceremonial shovels represent more than the start of construction. They represent the future for hard-working Yonkers residents who deserve the highest-quality housing options at rates they can afford during these challenging economic times. These residents are the heart of this great city and the reason Yonkers is undergoing a major transformation. "I would like to thank all of the government officials and corporations involved in the development of these two projects. With their help, we have remained true to one of our core missions, providing Yonkers residents - young and old - with new opportunities to live and succeed in our community," Amicone said. Located at 110 Ashburton Ave., the four-story Park Terrace at Croton Heights complex will feature 49 one-bedroom apartments available to Yonkers seniors with incomes no higher than 50% of the area median income (AMI). All 49 units will be covered by a Section 8 contract. The building will be equipped with underground parking, elevator access, a community room, and on-site laundry. Park Terrace will attain a LEED Silver status (Leadership in Energy and Environmental Design) by utilizing environmentally friendly green building practices and materials during construction. The facility is expected to be completed in spring 2011. Grant Park at Croton Heights will offer 100 one, two and three-bedroom multifamily apartments in four buildings each with elevator access. The development will also feature a community clubhouse including a club room, computer room, fitness center and on-site management office. Residents at Grant Park must earn no more than 60% of the AMI. Income requirements are adjusted by family size. Grant Park is the first section of the planned 240-unit community on the old Mulford site. Construction is expected to be completed by spring 2011. To help keep the apartments affordable, the Yonkers IDA approved incentives for the developer including a real property tax agreement, mortgage tax exemptions, and sales and uses tax exemptions for construction. Lynch said, "The Yonkers IDA remains focused and committed to improving the quality of life for all Yonkers residents. Through crucial tax incentives, in the past two years the IDA has played an integral role in more than $120 million in affordable housing and has created hundreds of jobs. Grant Park and Park Terrace will be important additions to our community and a proud reminder of Yonkers' commitment to affordable housing. We look forward to the ribbon-cutting ceremony next spring." Once home to thousands of Yonkers residents, the deserted Mulford Gardens Public Housing Complex is Yonkers first and one of the country's oldest public housing developments. The ground breaking of Park Terrace and Grant Park is part of mayor Amicone's $180 million Ashburton Urban Renewal Plan engineered to remake one of the oldest and most blighted sections of the city. The developments are also part of the HOPE VI Revitalization Plan, a federally-funded program that seeks to replace severely distressed public housing projects occupied exclusively by low-income families, with redesigned mixed-income housing. 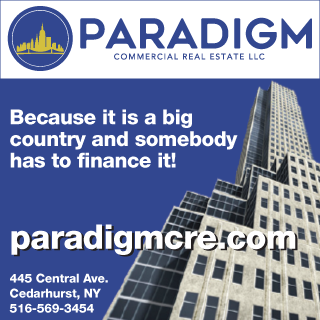 Other significant financing sources, public and private, include the New York State Division of Housing and Community Renewal, New York State Housing Finance Agency, Bank of America Merrill Lynch, Citi Community Capital, The Federal Home Loan Bank of New York, The Richman Group Affordable Housing Corporation, Westchester County Planning and the US Department of Housing and Urban Development's HOPE VI Program. 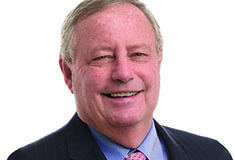 Miller, president of The Richman Group Development Corp. and a co-developer of the two projects said, "The start of construction on Grant Park at Croton Heights and Park Terrace at Croton Heights is an important milestone for the City of Yonkers and its residents. The fact that we are here today to celebrate the next phases of the Mulford Gardens redevelopment project is attributable to the hard work and collaboration of all stakeholders including the mayor, his staff, planning and zoning officials, the Building Department and most importantly the former residents of Mulford Gardens. We are also grateful to the public and private partners who have provided critical financing for these two projects: the US Department of Housing & Urban Development, New York State's Division of Housing & Community Renewal and Housing Finance Agency, Westchester County, the city of Yonkers, the Municipal Housing Authority for the City of Yonkers, City of Yonkers Industrial Development Agency, Bank of America Merrill Lynch, Citi Community Capital, and the Community Preservation Corp. The list of participants that have helped bring these developments to fruition is long and impressive and without the help of each and every one on it, this ceremony would not be taking place today. We would like to extend our deepest gratitude to all of the partners who have worked with us throughout this process." Brian Lawlor, commissioner of the NYS Division of Housing and Community Renewal and President/CEO of "nyhomes" said, "Congratulations to Mayor Amicone, the co-developers The Municipal Housing Authority for the City of Yonkers,The Richman Group, Landex Development, LLC, and to the future residents of Park Terrace and Grant Park. Today we celebrate the transformation of a blighted, distressed property into mixed-income, energy-efficient, affordable housing. I commend President Obama, congresswoman Lowey and the New York Congressional Delegation, and the Department of Housing and Urban Development for their commitment to this project and others like it across New York State and the country. This undertaking will have an enormous impact on the quality of life in Yonkers. The economic downturn threatened the financing and the viability of both these projects, but thanks to community support, a strong public and private partnership, and assistance from the federal stimulus package, senior citizens and families will soon have access to comfortable, affordable housing for years to come."